I am pleased to be the featured photographer in issue 27 of PhotographyBB magazine. 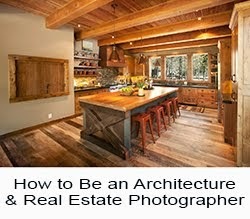 http://www.photographybb.com/magazine/ Keep Reading: Full Post and Comments! I had an assignment to shoot this photograph for an annual report and as always, I try to avoid photographing exclusively with available light. The reason is that available light in a manufacturing plant rarely compliments a scene that requires good lighting for an effective photograph. On the other hand it is difficult to use artificial light exclusively and have the scene look believable as well, so I use a combination of both ambient and strobe. The image below shows the scene before I have setup a single light. There is detail everywhere and that is good but ceiling lights are blown out and some of the shadow areas need to be brighter. My approach is to add some overall broad additions to the lighting and some selective spots as well. Here is how I did it. I have the pleasure of being featured today on Lensflare35 a podcast featuring professional photographers. Keep Reading: Full Post and Comments! I have a client that makes valves for the industrial markets. 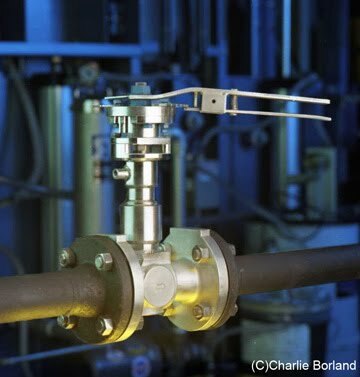 When I visited the company plant they asked me to shoot among other things, a new valve they had just launched into the market. I could have just set it on a table and shot it or on seamless but they wanted a photo that looked like a real installation. The problem was there was no installation here to photograph and they did not want to spend money sending me to a client location. Instead we faked it and here is how. 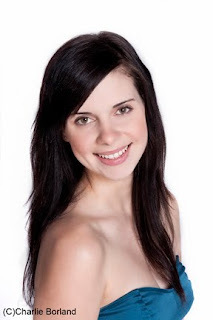 Ring lights, aka ring flash, have been popular and in style for years. They offer a nice soft quality of light and when your subject is against the background you get a shadow around your subject. These were originally designed for macro and medical photography, but these days are used in fashion photography as well as general people and portrait situations. I like the ring light look but also feel it is trendy and will fall in and out of style. Both Canon and Nikon make ring lights as well as some third party manufacturers. There is also the Ray Flash which works with your existing flash unit. These small units have small guide numbers and are not very powerful making them good for fairly close-up subjects. Several major lighting manufacturers make ring lights, such as Calumet, that have substantially more power. The prices are around $2700 and I don’t feel I would get the use from one at that price. 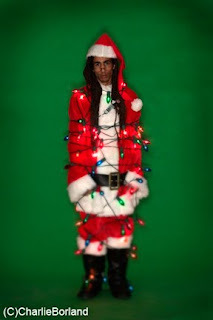 Here is how I lit my Santa with a ring flash look. 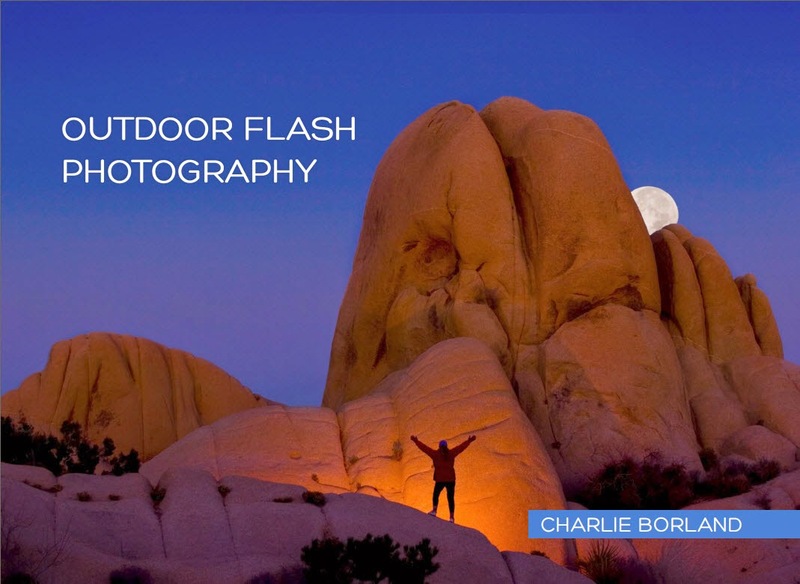 I am pleased to announce that I will be joining George Lepp, Les Voorhis, and other distinguished photographers leading a wide variety of workshops at this first annual event. 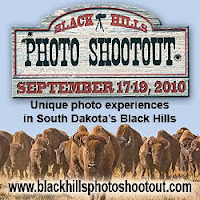 The Black Hills Photo Shootout is the brainchild of the Senior Photographer, Chad Coppess, of the South Dakota Department of Toursim. Workshops incluide Photoshop, Nature Photography, Ghost Towns, Widlife Photography, and more. Keep Reading: Full Post and Comments! 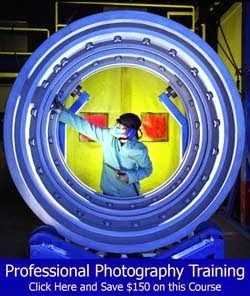 Industrial photography often has you looking for locations amongst ugly and filthy environments. Often clients will tell me that they want to shoot at a certain location but they have no idea what there is to photograph the subject in front of or within the surroundings. 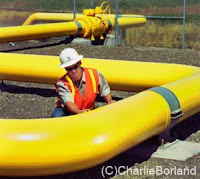 This client led us out to a site of a natural gas facility and when I saw this yellow pipe I thought this is the spot. There was nothing else there for the most part. Once I shot a test shot and showed it to the client she liked the shot and was convinced. Here is the setup. When I am not on assignment or doing post production on client work and can break away for more than a day, I love traveling and shooting the landscape. Then using all the cool tools and plugins for really messing up an otherwise normal image. I shot this image in Anza Borego last year on my way back from California. Images that dont have a deadline seem to sit patiently on the hard drive until I get so board with the lack of creativity that each day seems to bring, I decide to look for an image and work on it. 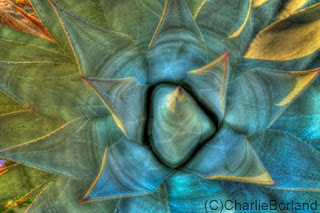 Here is this Agave that I decided to shoot. 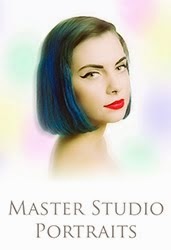 I recently had a shoot with a young lady in the studio and wanted to achieve the soft, flat look using a large light source. I chose to use my 7' Photoflex Octodome which a great light source if you want a large soft light quality. I have also used it for shooting large groups of people because it has such a large coverage area. I placed the Octodome over camera and then just to the side a little to add a faint shadow next to the nose. I then added another monolight next to the camera with diffusion material over it and to act as a fill light and had it set to -1 from the Octodome. Here is the diagram. Casey Templeton has designed a very cool promotional campaign based on a lunchbox stuffed with cool little gadgets all labeled with his name. His post also shows how popular it was among art directors and buyers and landed some assignments. That's what innovation brings these days. Check it out here! Keep Reading: Full Post and Comments! 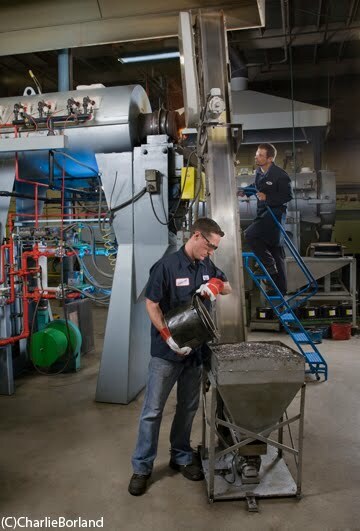 Here is an industrial photograph of a new product release shot on location. This was toward the end of the day in 100 degree plus shooting day and everyone was worn out. The client came in here, looked around and said she did not know what to do or how to shoot in here. 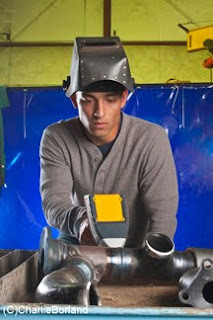 It was a metal fabrication facility and very dirty with stuff everywhere. Not styled for a photo shoot. I just want to let you all know that a person by the name of Jeff Visaya has decided to capitalize on my name in the photographic community by starting a blog called Charlieborlandnow.com. I have obviously nothing to do with this site. The domain, charlieborlandnow.com is registered to Jeff Visaya of Milpitas California. A search for Jeff brings up this blog Jeffvisaya.com. based in San Jose. Coincident? I dont know if this is the same Jeff Visaya that runs charlieborlandnow.com or not because the domain is registered by proxy. 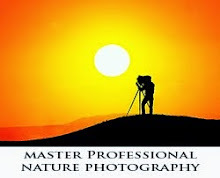 Either way, I plan to check the legality of a person who appears to be a non-photographer (if jeffvisaya.com is the same person that registered charlieborlandnow.com, he is an engineer) using the name of a well known and highly visible photographer, in their domain name. Charlie Keep Reading: Full Post and Comments!